At Shirtworks we are able to offer a full range of labelling, relabelling and bespoke promotional branded clothing services tailored to your exact requirements. If you are looking to launch your own brand of clothing and don't want to commit to 1000's of shirts made with your own label we offer a relabelling service. There is a minimum number of labels that have to be made, which can be held by us and we simple re-label the exact number of garments you need each time so you don't have to commit to buying lots of stock. This means that with low volume digital printing you can launch a brand with only a small amount of capital. Re-labelling is a two step process, the old label needs to be removed. Once removed a new one is sewn in together with a size label if needed. 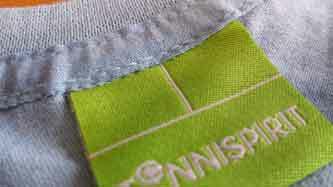 Some brands such as Continental and Anvil come with just a size label so you can use the same label for all the sizes. Others such as Gildan need either a different label for each size or an additional size label. The new label needs to be sewn into the collar of the shirt. To do this the collar needs to be unpicked, so even if we don't need to take an old label out we still have to unpick the collar, which is time consuming. 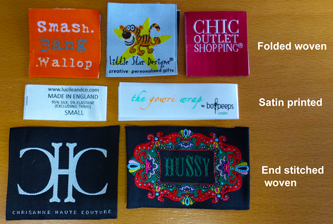 There are various types of labels but the most common ones we use are woven fold over label or printed ones that are sewn under the back tape neck line. The end stitched label can be sewn directly on to the garment, this can also be heat applied which reduces the cost. Printing directly onto the inside of the neck is another popular way of branding a shirt but it is subject to minimums print runs, alternatively we can produce transfers and apply them only when required. This is great if you looking for a smooth scratch-free solution. Prices will vary depending upon the label but the minimum of labels that need to be produced is 500 and will typically cost about £150.00, on top of that the taking out and/or putting in the new label is charged from £0.65 pence per label. Please email us your requirements and we will give you a bespoke quotation. We can also use your own labels if you have them already.